When: Thursdays, thru October 12, 9:00 a.m. -2:00 p.m.
Our crafters and makers are artists using their special talents and creativity to make beautiful and one of a kind pieces that are handmade and homemade. Our growers are local farmers who bring their produce to market fresh from the fields. The Market is a happening place every Thursday! Come join your neighbors and friends and enjoy the view as you sit on one of the many benches or swings that line the waterway. Just a short drive away from Calabash is La Belle Amie Vineyard, an operating vineyard open to the public. This weekend, check out the Dog Days Blues & Jazz Fest, from Noon-5PM. Admission for this event is $8. La Belle Amie Vineyard is located just south of Little River, SC. on Hwy. 90, a two lane back country road. The vineyard is a popular attraction for visitors to our wonderful beaches and hosts many popular festivals and events during the year. Vineyard guests are invited into the wine tasting room to sample our wines and a variety of sauces, spices, and preserves. Remember to bring a lawn chair, a good friend or two, and enjoy the company, the music, the wine, and the beauty of the vineyard. NO outside BEVERAGES or PETS allowed at this event. The 2017 Leopard’s Chase Golf Club Members Championship tournament will be held on Tuesday, October 3rd, with tee times starting at 8:30 am. Join us for a fun day of golf and socializing with your fellow Leopard’s Chase members. The sign-up closes September 28th. 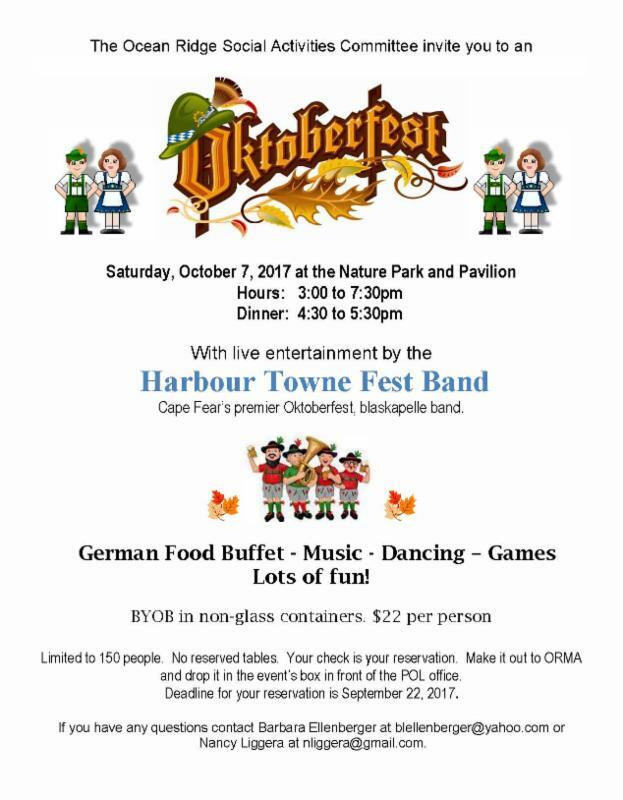 An awards ceremony and social will be held at the Ocean Ridge Nature Pavilion at 3 pm. Non-playing spouses and guests are invited to attend. Those attending are asked to bring an appetizer to share and their own beverages. If you have any questions or problems signing up, please contact Charlie Augone at caugone@atmc.net or call him at 910-575-5354. When: Saturday, Oct 7, 2017 – 10:00 a.m. – 5:00 p.m. When: Saturday, Oct 7, 2017 , 7:00 a.m. – 12:00 p.m.
Join us for the annual Run Ocean Isle Beach Half Marathon, 5K and 1 Mile Road race to take place on Saturday Oct. 7th. This race is a crowd favorite as half marathoners enjoy one of the most beautiful courses over the intracoastal bridge and across the entire island. 5Kers enjoy a flat route (not out and back!). This event takes place on the island on E. 2nd Street across from the Pelicans Perch restaurant and the Museum. The Half Marathon will get us kicked off at 7am. We will start the 5K just a little later at 8am at the same start/finish line and the 1 Mile Fun Run will head out around 8:15. Awards will be held for the 5K and 1 Mile racers at 9:15 in our after party area right next to the finish line. When: Oct 21, 2017 – Oct 22, 2017, Sat. 9:00 a.m. – 6:00 p.m., Sun. 10:00 a.m. – 5:00 p.m. I hope you have had a wonderful summer of family, beach time, and also quiet reading time as well. We look forward to getting together once again and discuss some fascinating books. Our first meeting this fall will be on Thursday night, September 21, 7:00 p.m. at the Plantation Club. Our September book is Pope Joan by Donna Woolfolk Cross. This book has been around for awhile, and is a fascinating and richly imagined work of fiction. The author makes an excellent and entertaining case that, in the Dark Ages, a woman sat on the papal throne for two years. The book is written as a fast moving tale, and with a wealth of rich historical detail. If you like books that you can’t put down, this one is certainly in that category. If you have any questions about LitWits, please give me a call at 910-612-3685 (cell phone) or Mary Fitzgerald at 910-579-8971. We would love to have you join us each month. We meet the third Thursday evening of each month at the Plantation Club at 7:00 p.m. Thank you – and we hope to see you in September. Night at the Planetarium – Friday, September 15 – Sold out! Music lovers out there get ready to enjoy this summer’s lineup with its usual roster of beach music, shag, oldies and rock and roll. All concerts take place in the parking lot at the Museum of the Coastal Carolinas on Ocean Isle Beach and best of all they’re FREE! Blackwater Rhythm and Blues will play blues/funk music at this LAST concert of the season! Sea Turtle Talks take place at 7:00 pm Sunday evenings during the nesting months. Members of the Sunset Beach Turtle Watch Program will discuss the life cycle of sea turtles, show a movie about nesting loggerhead sea turtles and answer your questions about these gentle giants that nest on our beaches every summer. Our location is convenient for all in the greater Sunset Beach area. Arrive early to claim your spot and visit our food court. We feature Papa John’s Pizza & Chicken Wings, Dixieland Kettle Corn, and Sunset Slush Classic Italian Ice. This is a wonderful, family-friendly event. The Embers, Craig Woolard will play variety/beach music this upcoming week! When: Mondays, thru September 11, 9:00 a.m. -2:00 p.m.